This April, KidsFirst is celebrating National Child Abuse Prevention Month with a variety of activities. The agency is spreading awareness of the hidden epidemic throughout Placer County and surrounding areas. KidsFirst kicked off the month with their annual “Putting Kids First” luncheon. With Roseville’s Mayor Carol Garcia as emcee, the event highlighted the importance of working together to end child abuse within our community. The gathering took an emotional turn when author and survivor Keith Edmonds shared his personal story of abuse. Local individuals who demonstrated outstanding efforts in the fight for the cause were awarded, including Roseville Police Detective Derrick Phelps; Jim Crosthwaite of Rocklin Parks and Recreation; and Joanne Evans of Placer County Health and Human Services. KidsFirst partnered with various agencies to further promote the national month. On April 6th the organization raised $3,700 in collaboration with the Rocklin and Auburn Dutch Bros Coffee. Residents showed support all day long by purchasing cups marked with blue ribbons as a symbol for the fight against child abuse and neglect. Thanks to the help of the community, the day was a success. On April 20th, Blue Line Arts and KidsFirst partnered to host The Dream Project. The celebratory night had a creative flair, displaying children’s artwork around the gallery walls as guests mingled over h’ors oeuvres and refreshments. The goal was to spark the children’s imaginations while guiding them to actualize their dreams. Throughout the month, KidsFirst has been promoting planting pinwheel gardens to show support for child abuse prevention. Pinwheels represent whimsical, playful notions. They embody the great childhood every kid deserves. All are encouraged to participate in the pinwheel challenge by posting a picture of their personalized gardens on social media and twitter with the hashtag #puttingkidsfirst. Pinwheels for gardens are available @ kidsfirstnow.org or by phone 916-774-6802. The U.S. loses between four to seven children each day due to abuse and neglect. The cost of prevention is 100 x less than the cost of a child abuse case. Awareness is an important key to prevention and early intervention. Everyone has the power to make a difference in a child’s life - this month and throughout the year. By investing in our children, we are investing in our future. KidsFirst is a non-profit organization established in 1989 dedicated to the prevention and healing of child abuse and neglect. KidsFirst provides an array of programs and victim services that prevent and treat abuse. In this role, KidsFirst educates professionals, government officials and lay persons regarding child abuse and neglect and its prevention. KidsFirst works closely with other community-based organizations and county agencies to ensure non-duplicative, effective service delivery to meet the needs of children, families and individuals in the community. 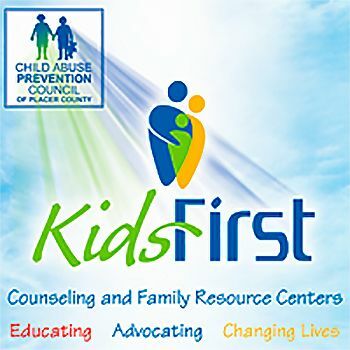 Providing an integrated system of safety net programs and services to children and their families, KidsFirst operates Family Resource Centers in Auburn and Roseville, serving western/southern Placer County. Services include child and family counseling, parent education, youth groups, after-school programs, information and referrals to low/no-cost resources in Placer County.